HMAS Canberra Departs Fleet Base East, Sydney for Exercise Talisman Saber 2017.Image via Commonwealth of Australia, Department of Defence. 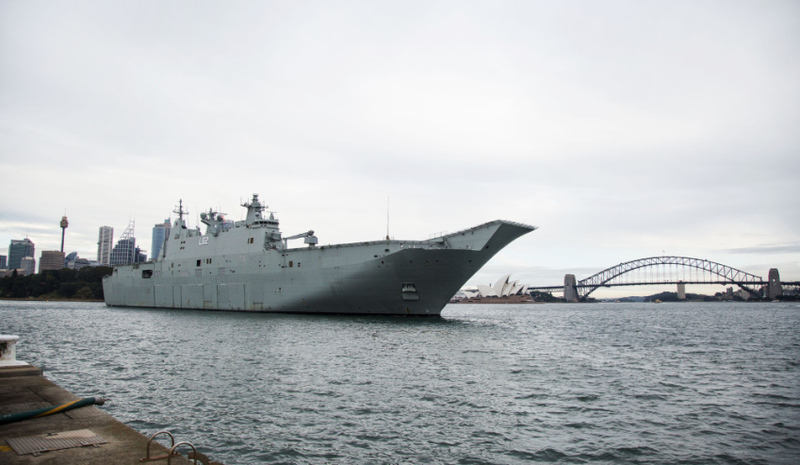 The division of costs for repairs to HMA Ships Canberra and Adelaide’s propulsion pods is still being discussed, according to the head of maritime systems for Defence’s Capability Acquisition and Sustainment Group (CASG). At Senate estimates last week, South Australian senator Alex Gallacher queried whether any, or all, costs of repairing the azimuth propulsion pod systems would be recovered through a "warranty" for the vessels, which are expected to be in service for three decades. Rear Admiral Adam Grunsell, AM, CSC, said negotiations with industry are still underway to determine the split of costs for repairs to the Landing Helicopter Docks (LHDs). "I don't have the figure of the total cost, and in fact it's still under negotiation with industry as to what the split of those costs will be," RADM Grunsell told Senate estimates. "We're in negotiation with industry, and our intent is to recover some of the costs from industry." The LHDs, which cost about $1 billion each, were designed and built by Spanish company Navantia with help from BAE Systems and German company Siemens. The vessels were dry docked in Sydney from March this year until the end of June following issues in their propulsion pod systems. As previously reported on Defence Connect, Chief of Navy Vice Admiral Tim Barrett confirmed there was a migration of oils across seals in the LHDs' azimuth propulsion pod systems. Defence has since confirmed the docking and inspection of Adelaide identified wear in some bearings in the port pod, which was assessed to be the likely cause of the oil contamination. VADM Barrett told Senate estimates that Defence has "taken a cautious approach since" and the vessels will continue to be monitored over a period of time as they look at other issues during test and evaluation. "There are other issues that we would seek to look through with the ship during this test and evaluation period to confirm that we have resolved all the issues we need to – noting that this is two years into a 30-year life," VADM Barrett said. The Chief of Navy also quashed rumours that Australia's operational intensity of the vessels is unsuitable for the ships, but added they are looking at its operations to ensure Defence's initial judgement on design and sustainment are suitable. "We're looking at how that ship is operated and how we operate, to make sure that our initial judgements on design intent and sustainment practice are contemporary and appropriate to the way that we operate," VADM Barrett said. "There's been no indication from the ship designer, in Navantia, as to how we're operating the ship. We do drive the ship differently from the Spanish navy, from the armada, and, again, we are looking at that, but we are not – and it has not been indicated by the original equipment manufacturers that we are – operating outside the limits of what the equipment was designed to do. "My biggest issue will be making sure we only use them at sea equivalent to the number of sea days that I'm funded to be able to provide them – and that is part of the sustainment issue. That is, if I've only got spares and maintenance to run them for a certain number of days a year and I'm asked to operate them beyond that, then I start ageing the platform far more quickly than we had intended and it wouldn't last 30 years." The 27,000-tonne amphibious assault ships were commissioned on 28 November 2014 (Canberra) and 4 December 2015 (Adelaide). The ships are able to land a force of over 1,000 personnel by helicopter and water craft, along with all their weapons, ammunition, vehicles and stores.